Are poor-quality digitized files obstructing the successful conduct of your business? Perhaps the sewing process is cumbersome due to thread breaks or other problems, or the appearance of the sewouts is less than optimum. If so, we would welcome the opportunity to participate in bringing your dilemma to its conclusion. Before we introduce Idigitizing’s service to you, please learn what some of our customers say about our embroidery digitizing services. Idigitizing can work with most graphic formats – both vector and bitmap types. Our team of digitizers uses Tajima digitizing software to create a digitized file from the graphic depiction of your logo. Send us your artwork to sample our custom embroidery digitizing service for your first order – at 70% off for that first order! All of the professional digitizers on our team have at least 15 years experience digitizing. We digitize all orders applying the highest artistic and technical skills, keeping final production in mind. All of our finished digitizing must pass three strict inspections before being e-mailed to the customer. The first inspection – of the digitized file - is executed immediately after the digitizing is completed. Then the digitized file is sewn out. Then, the sewout is carefully examined, and refinements are made to the Tajima file if needed. We can provide you with the highest quality embroidery digitizing work, so we are confident to enunciate this declaration: You will not pay until you are satisfied! Our completed digitizing files are e-mailed to the customer within 24 hours. Rush digitizing service is available. Our customer can receive the finished embroidery DST file within four hours of our receipt of the order, and no additional fee is assessed. We provide 24/7/365 embroidery digitizing service. Members of our team of embroidery digitizing personnel are all available to act on your requests at any time. Our professional embroidery digitizers can rapidly convert the internal code of a digitized file to most of the formats compatible with different types of embroidery sewing machines. All such conversion work is done free of charge. Who Are We and Why Should You Try Us? 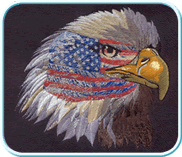 Idigitizing has been in the embroidery digitizing business since 1994. Our collective working experience in the field of embroidery has enhanced our ability to provide quality digitized products. Our thousands of satisfied customers are our best testimonials. We are not the only providers of custom embroidery digitizing service. There are numerous others charging a wide range of prices – some higher than ours, some lower. Our pricing contains no hidden fees. The price per thousand stitches x the stitch count is your final cost. You get a high-quality digitized file, a scan of our quality-control sewout, four hours turnaround if requested, no-charge editing (in most cases), and free file format conversion. Choose Idigitizing, We are your reliable partner!!! Embroidery Designs and Embroidery Digitizing Service. All of our embroidery digitizers are experts in the embroidery digitizing industry.